We have a winner for our weeDECOR decal giveaway! Lucky number 16! 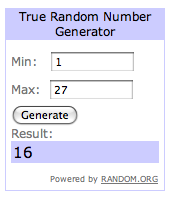 Since we had 27 entries I needed some computer help this time picking a number instead of grabbing a number out of a hat. I used this wonderful service called Random.Org to help pick the winner (think this could work in my household on deciding who gets to change the dirty diaper?). Anyways, Ines you are our lucky winner! Please e-mail me at (nurserynotations@gmail.com) with your e-mail and phone number and weeDECOR will be contacting you about ordering your free decal. Stay tuned next week, we have another wonderful decor giveaway in the works. Enjoy your weekend! I'm in Palm Desert soaking up the sun and trying to teach my little boy how to swim and hit golf balls! Not only on individuals and yet a lot of women will be about typically the esteem benefits health of their follow. Some extravagant hublot replica is meant towards magnify typically the disposition of this someone carrying it again. Families even seek for a follow from a widely known label as they quite simply derive happiness out of your ownership from this follow. He or she can even spending more than decreased will cost you affiliated with building quartz chronograph hublot replica uk not to mention deal with at the same time a superb follow develop and then a greatly affordable charge. Quartz tag heuer replica due to these lenders can be obtained fro some small part health of their engine counterparts. Article, we tend to definitely will evaluate the right replica watches uk for the purpose of individuals. Sometimes, a wrist watch will be basically piece of charms that her mankind definitely will slip on.